The latest release from the Littlest Pet Shop is Littlest Pet Shop: Lights, Camera, Mongoose! and is available on DVD and Digital Download from this Monday - October 19th. 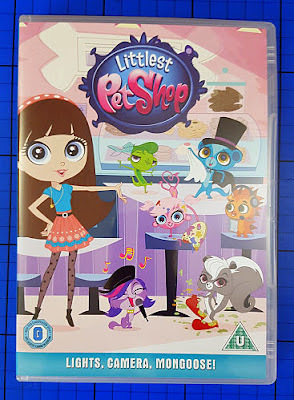 Littlest Pet Shop tells the stories of Blythe Baxter, a young girl who lives with her Dad above the pet shop. Blythe spends her time caring for the animals and having some fairly bizarre adventures. (episodes 1-7 of series 1 Littlest Pet Shop are available on the Littlest Pet Shop: Little Pets, Big Adventures DVD). We've been sent a copy of Littlest Pet Shop: Lights, Camera, Mongoose! to review. The stories are all fairly humorous and interesting, with a healthy dose of magic and fantasy. The title episode itself is a fairly typical and pretty bizarre adventure. A superstar mongoose called Shahrukh is in town filming his latest movie and the pets and Blythe go to see him on the film set using Blythe's magic flying scooter. Shahrukh wants a break from being famous and so the Littlest Pet Shop's own mongoose Sunil swaps places with Shahrukh, but it doesn't go as you'd expect and the already exciting day goes fairly crazy. My boys are 5 and 7 and both actually really enjoy Littlest Pet Shop. The stories are a little more complicated than some children's programmes, so it is more interesting for age 3+, but smaller children may be happy to watch it anyway, as it is bright and cheery with lots of animals and some music and song. 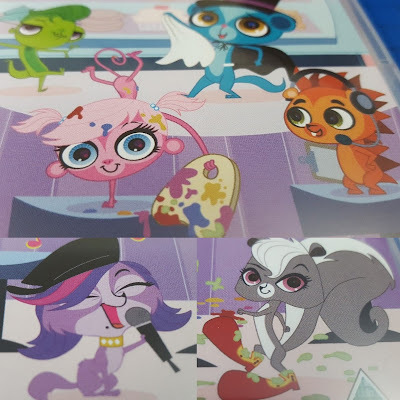 Hasbro Studios have very kindly offered a copy of Littlest Pet Shop: Lights, Camera, Mongoose! as a prize for one of my readers. Entry to the giveaway is by Gleam below and no entry is mandatory. Each extra task completed will earn extra entries into the draw. The giveaway will end at midnight Wednesday 11th November 2015. UK entries only please. Princess Leia in the Star Wars movies - loved her as a child - she had girl power and I want those huge buns!? Jennifer Lawrence, I'd love to run around in the hunger games! I'd love to change places with Jennifer Garner as she is such a powerful and respected actress! With Mila Kunis, she's stunning plus has a hot husband & amazing film roles. Cameron Diaz - beautiful and funny! Jenna Dewan just so I can wake up next to Channing Tatum every morning! Angelina Jolie, because I love the humanitarian work she does, I love her style, and I'd love to fall asleep next to Brad Pritt for the night! Helen Mirren as she is such a good actress. I would like to change places with Calista Flockhart because I fancy Harrison Ford. I would change my wife for Angelina Jolie but don't tell her. I would love to swap places with Sofia Vergara because she's engaged to Joe Manganiello and I'd just love to have her lifestyle!